Could Mouthwash Cure Gum Disease? It would be nice if a quick rinse was all it took to disinfect your mouth. The bacteria that cause gum disease, however, are too stubborn for such a simple method to work. Why Is Periodontitis So Tough to Treat? Gum disease (periodontitis) is caused by bacteria that thrive in the low oxygen conditions below the gum line. That’s a place where toothpaste, toothbrushes, and mouth rinses can’t always reach. A simple over-the-counter rinse is powerful enough to control daily levels of bacteria. But if periodontitis has already set up camp, then you need something much stronger. The germs create a dense slime layer to protect themselves from something like a simple mouthwash. To get those stubborn germs to budge an inch, you need some physical intervention. 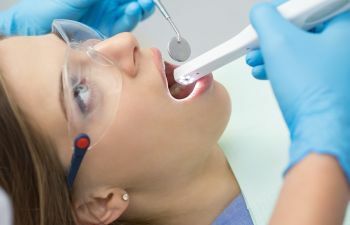 Professional dental cleanings mechanically remove bacterial films and the tartar deposits they grow on. Some cleanings are meant to smooth root surfaces roughened by bacterial growth. After having a professional cleaning to the degree necessary, you may start on a course of antibiotics to finish off the stragglers. Antibiotic therapy can include a medication or prescription rinse. An over-the-counter antibacterial rinse is great for everyday use. When paired with proper brushing and flossing, a mouthwash could help you avoid developing gum disease. …then it’s probably time you get professional help. Contact the best dental office in Columbia for tips on keeping your gums healthy. The Columbia Dental Center team looks forward to hearing from you!